A couple of weeks ago, I sat in Good Enough to Eat on the West Side and prepared for class. I teach creative writing at the JCC Manhattan from 12-2 so I always eat a big breakfast ahead of time. While I was going through my students' submissions, I heard a familiar voice. I looked around the restaurant, I didn't see anyone I knew. I went back to reading and eating vegan tofu. "He's had a great career." "I would say you'll survive." "I wish that were true but it's awfully nice of you to say." "I'd be happy to. Actually, I wouldn't be happy to but I'll do it anyway." That last bit was said to the two women who were sitting at the table next to him. I got the feeling that they didn't know him at all, but were sitting so close, they couldn't help but ask him for a favor, and because they were sitting so close, he couldn't turn them down. I felt a little sorry for him. Comedians hone their talent, get lucky, become famous and then they are stuck having to be nice and cheerful and do favors for people in public places, or they have people like me busy listening in on their conversations and writing it all down. I thought about going up to him. If you've ever been to Good Enough to Eat, you know the restaurant is small, dark and cozy. The place is filled with ceramic cows, old cookbooks and Grandma's china--everything feels homey and accessible. You'd think it would be an easy place to approach people. The wait staff is filled with friendly, good-looking male actors---and when I say good-looking, I mean that one of them is the most drop-dead gorgeous flirtatious twentysomething I have ever laid eyes on. But I digress. Despite the old-fashioned, family feel, it's still New York, and in New York, you don't just throw yourself at celebrities. You glance at them, look away, start texting everyone you know, then run home and call your friends. I didn't say a word to Jerry Seinfeld. As I was leaving, I whispered to my favorite waiter, "That's Jerry Seinfeld." "I know." He grinned. I went to class and told my students what happened. They agreed it would have been unseemly to buttonhole Seinfeld. That night, I told my kids. My older son couldn't believe I hadn't spoken to Seinfeld. He is almost 15 and studying stand-up comedy in the city. In the club where he takes his class there are large portraits of successful comedians who have performed there. The one of Jerry Seinfeld commands the lobby. You can't miss it. Seinfeld stares right at the camera, debonair, and smiling slightly. My older son reveres Seinfeld, Tina Fey and the entire cast of "Saturday Night Live." "I wanted to talk to Seinfeld," I said, "but I worried he'd get mad at me and then I'd be all rattled before I taught." My older son looked disgusted. "You should have told him about me!" he said. "I would have said something. If you'd spoken to him, you could have written about it." Then, last night, I went to a fundraiser for the Jewish Museum in Manhattan. Jason Alexander was the entertainment. You probably know that Jason Alexander was "George" in Seinfeld. You may also know that he grew up in New Jersey. My husband whispered that Jason was sitting at table 17. We were sitting at table 28. My husband, who usually is far more discreet and restrained than I am, wanted to go talk to him. I didn't think we had it in us but we went and danced near his table anyway. We watched him talk to another couple. We kept dancing. Jason kept talking. We danced back to our table. A few minutes later, Jason went up on stage. He had a straightjacket with him and asked three members of the audience to strap him into it. For his act , Alexander struggled to get out of a straightjacket. While he did this, he told the Purim story: Esther, Mordechai, Haman, King Ahasuerus, Queen Vashti, the whole business. It took Jason about twenty minutes to tell the Purim spiel. Jason was funny, not hysterical, but irreverent and delightful to listen to. We laughed a lot. The show ended. My husband went to get his coat. My friend Julia and I went downstairs to find the car. 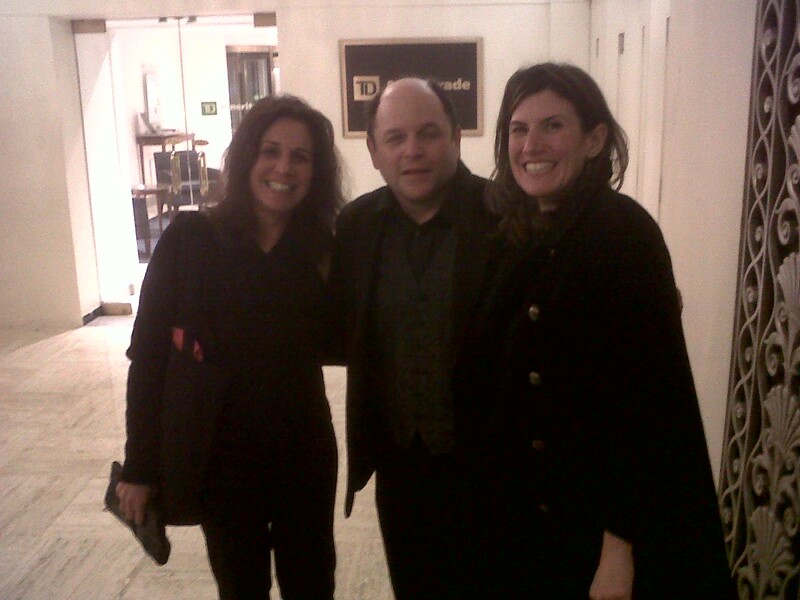 There, was Jason Alexander, heading for same revolving door! "Jason," I cried. "We love you. We're from New Jersey!" He turned towards us. He smiled. He has a lovely smile. Really decent and friendly. His eyes narrow and his mouth spreads into this wide. welcoming grin. I started babbling about New Jersey and how we were all from the same county. "Didn't you go to Columbia High School in South Orange?" I asked. "I would have," Jason said, "but I moved to Livingston so I graduated from Livingston High School." He was gracious. He smiled. Julia and I stared at him. "Can we take a picture with you?" I asked. I don't know where I was getting all this chutzpah from. I felt like I was 14 years old. I was channeling my older son. My friend's husband showed up. "Can you take our picture with Jason?" I thrust my phone at him. (My friend's husband had taken a picture of Rod Stewart in Florida over Christmas so he knew what he was doing.) Bill took the picture. Jason smiled wanly. What else could he do? Julia and I look about ready to jump out of our skins. There is no moral to this story except sometimes it feels good to admit you're from New Jersey, even when you're in New York.